As an alternative for reaching in, under and around obstacles, Manipulator Arm Systems allow an operator to precisely and effortlessly position loads regardless of physical strength. Fitted with an End Effector, manipulator arm systems perform a wide variety of material handling applications. Series 700C: 270-degree articulation Up to 500 lbs. 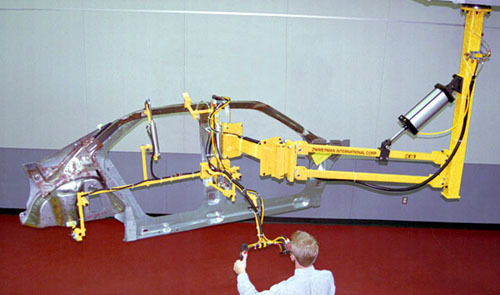 The 700C Arm is a “banjo” arm consisting of three connecting linkages which allows the boom/balancer combination to cover a large area. The arm can fold into itself and articulate 270 degrees to reach around columns, posts or other interference points. The 700C has a short stack-up, which is useful for low headroom applications because it minimizes interference with the operator. The balancer is mounted at the rear of the arm and pulleys in the center section route the wire rope to the front of the arm. Customer will need to specify balancer type, mounting option, carriage type, arm length and balancer controls when ordering. Series 713: 360-degree articulation, up to 500 lbs. The 713 arm is very useful in areas with limited space. It incorporates an over-under boom design with two linkages and two pivots. One pivot is between the mounting point and main boom and the other is between the two booms. Each pivot can rotate 360 degrees, which allows the operator full coverage of the work area, including directly under the carriage. The balancer is mid-mounted and pulleys in the center section route the wire rope to the front of the arm. Customer will need to specify balancer type, mounting option, carriage type, arm length and balancer controls when ordering. Series 720: 360-degree articulation, up to 150 lbs. Ideal for lightweight parts that require the operator to work directly under the arm, the 720 arm incorporates an over-under boom design with two linkages and two pivots. One pivot is between the mounting point and main boom and the other is between the two booms. Each pivot can rotate 360 degrees, which allows the operator full coverage of the work area. The balancer is mounted at the end of the arm. Series 400: Parallel link design Up to 800 lbs. Utilizing an air cylinder and parallel link design, the 400 series arm is an alternative for reaching in, under and around obstacles. The 400 series parallel link arm is designed to maintain either end effector or tool orientation and allows the operator to effortlessly position a part or tool. 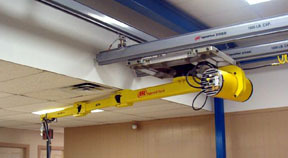 The 400 series arms are typically carriage mounted and adaptable to most overhead rail systems. Can be easily fitted with a standard or custom end effector depending on the application. 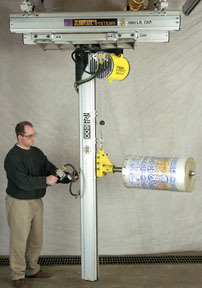 Series 600: Rigid vertical mast Up to 1000 lbs. For loads that can not wobble, and adaptable to most overhead rail systems, the 600 series arm consists of a rigid vertical beam with a moving horizontal beam that is able to reach into an opening. The unit features 360 degree rotation and utilizes an air balancer for lifting and balancing power. The unit can be used with a variety of end effector combinations.